Yesterday morning started off with some much needed stretching w/the mastermind behind the Nike Training Club, Marie Purvis at the piers of San Francisco. 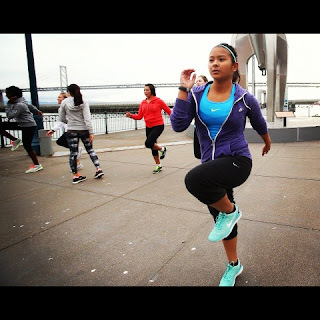 This is where we also had our 2nd photoshoot w/the Nike+FuelBand team. After that it was off to the Nike Expo to pick up our race kits. The atmosphere was energetic - there were stylist booths, hair and make up sessions, NTC mini sessions and so much more. Nike really knows how to keep the marathon participants pumped and primped for tmr's run. Then we had free time before dinner. Justin and I took the time to visit the must see Alcatraz - very creepy, I can only imagine how scary it would be to so the tour at night! I highly recommend doing the 45min audio tour *shudder* the background noises while you walk around will def add to the experience. John Anglin, Clarence Anglin, and Frank Morris inmates at the prison used cardboard, cement chips, and human hair from the floor of the barbershop to create fake human heads. They spent one year chipping away at the vent behind toilets for escape routes. Dinner time at First Crush located in Union Sq. w/ the Nike Women management team! Food was fantastic. Time to get in the carbs a few days before Sunday. Never carb load the night before a race. Thanks for the support and remember to check Facebook for the live tracker details. Nike Women's Marathon is here!! !